Tsagaan Sar, Mongol lunar New Year - By Mongolia Travel and Tours. 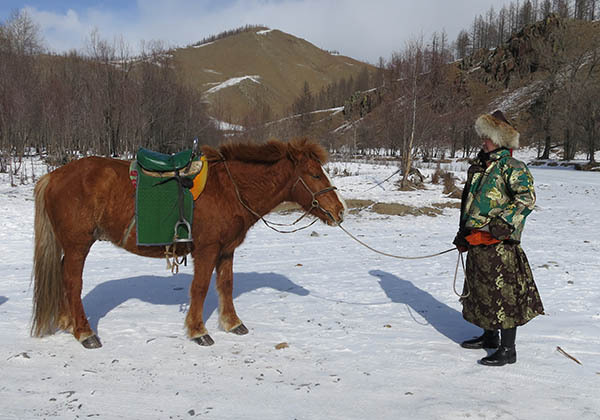 The harsh climate of Mongolia in winter often discourages travelers, who fear to face cold as low as -30 ° C.
However, the period of Tsagaan Sar, the Mongolian New Year, is particularly conducive to a trip to Mongolia, for the rich traditions that accompany this very important family celebration. Many traditions are associated with this symbolism and aim to start the new year auspiciously, the way we started the year is deemed to influence the course of it. Thus, all Mongols spend the evening of Bituun with their family, eat as much as possible to ensure that the coming year is "rich". For the same reason, everybody dress in new and the finest possible clothes. 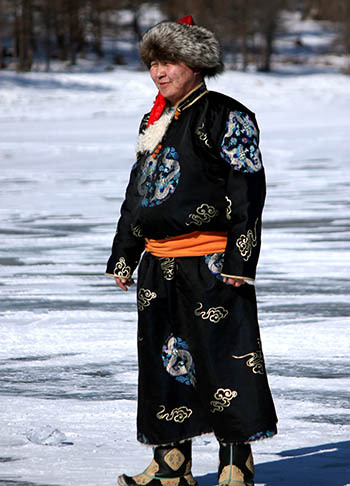 A trip to Mongolia during the week after Tsagaan Sar is always colorful, even the inhabitants of Ulan Bator wearing their finest traditional del. Ritual offerings are made on the morning of Tsagaan Sar, just outside of the yurt, and close to ovoos. These meetings also give opportunity to the traditional exchange of snuff boxes. All Mongolian people visit their family and friends to present their wishes, this is a period when everyone is moving much. Tsagaan Sar is a period of intense conviviality and social life, each family prepares several days in advance hundreds of buuz, traditional ravioli with meat. They will be offered to friends who presented their vows. Buuz quality is hotly discussed and compared, and it is a question of honor for the family, no question, therefore, to buy them all made at the supermarket! The traditional Tsagaan Sar table also shows a kind of "cake". It consists of an odd number of layers of biscuits ("two layers of happiness to frame a layer of evil" according to the beliefs Mongol), covered with sweets. It is very important to honor it. To take something from the Shiniin Idee, touch the base with your left hand and use the right hand.